LOS ANGELES (AP) — Channel blackouts such as the one that resulted from the recent spat between Viacom and DirecTV have become far more common over the past three years. Consumers can thank the changing dynamics of the entertainment industry. DirecTV subscribers haven't been able to view Viacom channels such as Comedy Central, MTV, Nickelodeon and VH1 since Tuesday, when the two companies failed to reach a contract agreement over content fees. The companies are still negotiating, but the channel blackout for consumers has continued through the weekend. The industry's cost pressures mean such fights are likely to continue. "I think this is the new normal," says Barton Crockett, an analyst with Lazard Capital. "It's getting to be a little bit more of a battle between life and death for these guys." The rising number of disputes is largely the result of the stagnant market for pay television. Simply put, there aren't many new households being formed in the sluggish economy, and those who want to pay for TV already do. Some 101 million American households subscribe to cable or satellite service. That's about 87 percent of homes, a proportion that has remained unchanged since 2009, according to Leichtman Research Group, which studies media and entertainment. TV distributors pay media companies a few cents per channel per subscriber each month. In turn, they try to sell packages of channels for more. As costs for those channels rise, so do monthly service bills, but not always by enough to offset the increasing fees cable and satellite providers are paying to media companies. In addition, distributors spend money on special promotions to woo subscribers from competitors. As a result, some companies' expenses are rising faster than revenue. That has prompted cable and satellite service providers to fight back against cost increases, even when it means blacking out channels until they can eke out a better deal. Satellite TV companies like Dish and DirecTV are in an even tighter squeeze than cable companies because they can't make up for higher costs by providing Internet or phone service. Major cable and satellite TV distributors DirecTV, Dish, Time Warner Cable, Cablevision and Charter have increased profitability over the last few years, but that's tapered off, according to an Associated Press review of FactSet data. Back in December 2009, they kept 15 cents of profit after subtracting operating expenses from every dollar of services they sold. That grew to 19 cents last September. But since, cable and satellite companies haven't found a way to wring more profitability from their business. Media companies have posted gains in part by extracting higher fees from distributors in bare-knuckle contract negotiations. Those gains have come directly at the distributors' expense. In the first six and a half months of this year, 22 fee disputes involving the price of broadcast TV signals have caused channel blackouts, according to the American TV Alliance. That's up from 15 blackouts in all of 2011. There were just four in 2010. Distributors say they must hold the line on their biggest expense —programming— even if they risk having customers defect. "I don't think the industry can sustain this kind of behavior," says DirecTV's executive vice president of strategy, Derek Chang, who accuses Viacom of trying to raise rates by 30 percent. "Ultimately, it'll drive costs up to the end user." People already have been paying more and more. In April and May, 1,369 Americans who were surveyed by the Leichtman Research Group reported that their monthly TV bill rose an average of 7 percent from a year ago, to $78.63. That's largely in line with annual single-digit percentage increases historically. What's different for distributors lately is that they also have to pay for broadcast TV station signals, which they used to get for free in exchange for carrying upstart new channels. 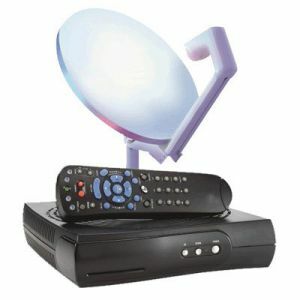 In recent years, broadcasters like CBS have demanded cash from TV distributors for broadcast signals, even though consumers who go through the trouble of setting up an antenna could get them over the air at no charge. "That's an expense that really didn't exist five or 10 years ago," says Leichtman Research Group's president Bruce Leichtman. "That's putting the biggest stress on the system." Russell Hawkins, a 36-year-old food company marketer in Clinton, Mich., says that because of the dispute between Dish and AMC, he's decided to end his four-year relationship with Dish and has asked his Internet provider, Comcast Corp., to hook up cable TV in a week. He had no problems paying $70 a month, but the prospect of losing AMC was too much. "They can't be dropping channels on people," he says. Now he'll save $40 a month by getting Internet and phone service bundled, and Comcast threw in HBO and Showtime for 2 years for free. His friends are contacting him about how to get the same deal. "A lot of others are going to do the same thing." David Jacobs, a 48-year-old social media consultant in Damascus, Ore., says he signed up with Dish just six months ago to pay for upwards of 100 channels for around $50 a month. But now, he's locked into a two-year contract and will have to pay hefty penalties if he cancels. He'll now have to scramble to find a way to watch the premiere of "Breaking Bad," his favorite show, which airs on AMC. AMC has offered to stream the episode free online for Dish subscribers. But he's not sure what to do. His options include paying extra for a download from Apple's iTunes or Amazon.com, or resorting to an unauthorized download from a pirate site. "These are big multimedia corporations," Jacobs says. "But me — the little guy who's struggling every day to get by and live life — I'm left holding the bag. That's what makes me the most angry." Categories: Consumer Beware, Did You Know??? That same foolishness happen to me with DirecTv last year; as it was a ongoing fight between a local channel; that's when I switched to AT&T Uverse; if they get into a war with anybody; I'm going cancel pay TV, and start reading books during my normal TV watching time, which some of us need to do anyway.